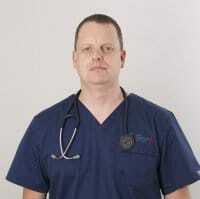 Dr Neil Wilson graduated from Glasgow University in 1993 and worked in farming practices in the UK before embarking on 10 years of emergency medicine at Glasgow then Edinburgh. Neil’s unique personality made this biography compelling because he is a much loved member of the AES Team and a man of few words. What we were able to determine (reading between the lines of his dry yet charming wit) is his keen interest in emergency medicine in small animals. In his spare time he enjoys mountain biking, cricket at the Gabba and malt whiskey.